Semi-desert. Openings, shrublands, woodlands. Spring. In early spring, the white papery bracts of Cymopterus bulbosus are eye-arresting. Purple/pink flowers push through the bracts and enlarge, the bracts fading away. Leaves are a beautiful pale green on broad flat stalks and provide a tasty treat for small critters -- notice the clipped stalks to the left of center. Alice Eastwood first collected specimens of this plant in Durango, Colorado in 1890 and Marcus Jones named the plant Cymopterus utahensis variety eastwoodae in 1895. 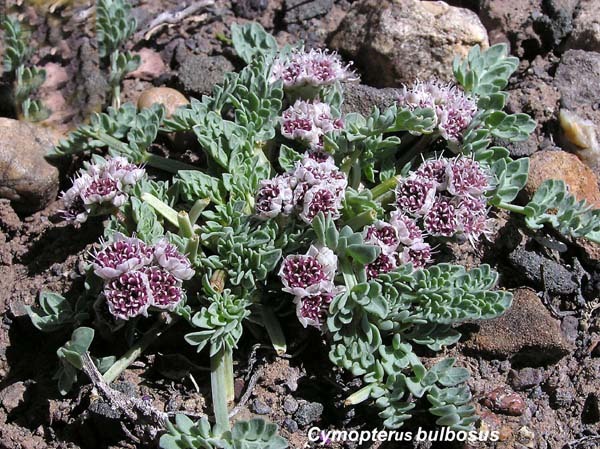 Aven Nelsen renamed this species Cymopterus bulbosus in 1899. The Greek "Cym" and "pterum" come together as "Cymopterus", "waved" "wing", referring to the fruit. "Bulbosus" refers to the enlarged root.